Case studies, surveys, naturalistic observation, and laboratory observation are examples of descriptive or correlational research methods. Using these methods, researchers can describe different events, experiences, or behaviors and look for links between them. However, these methods do not enable researchers to determine causes of behavior. Remember: correlation is not the same as causation. Two factors may be related without one causing the other to occur. Often, a third factor explains the correlation. Example: A psychologist uses the survey method to study the relationship between balding and length of marriage. He finds that length of marriage correlates with baldness. However, he can’t infer from this that being bald causes people to stay married longer. Instead, a third factor explains the correlation: both balding and long marriages are associated with old age. 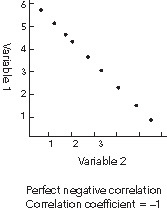 A correlation coefficient measures the strength of the relationship between two variables. 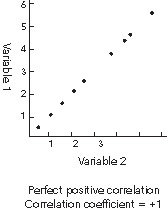 A correlation coefficient is always a number between –1 and +1. 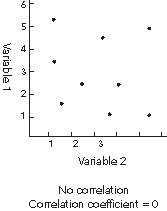 The sign (+ or –) of a correlation coefficient indicates the nature of the relationship between the variables. A positive correlation (+) means that as one variable increases, the other does too. Example: The more years of education a person receives, the higher his or her yearly income is. A negative correlation (–) means that when one variable increases, the other one decreases. Example: The more hours a high school student works during the week, the fewer A’s he or she gets in class. The higher the correlation coefficient, the stronger the correlation. A +0.9 or a –0.9 indicates a very strong correlation; a +0.1 or a –0.1 indicates a very weak correlation. A correlation of 0 means that no relationship exists between two variables. Common correlational research methods include case studies, surveys, naturalistic observation, and laboratory observation. In a case study, a researcher studies a subject in depth. The researcher collects data about the subject through interviews, direct observation, psychological testing, or examination of documents and records about the subject. A survey is a way of getting information about a specific type of behavior, experience, or event. When using this method, researchers give people questionnaires or interview them to obtain information. When using naturalistic observation, researchers collect information about subjects by observing them unobtrusively, without interfering with them in any way. Researchers create a record of events and note relationships among those events. With naturalistic observation, researchers face the challenge of getting a clear view of events without becoming noticeable to the subjects. As the name implies, researchers perform laboratory observation in a laboratory rather than in a natural setting. In laboratory observation, researchers can use sophisticated equipment to measure and record subjects’ behavior. They can use one-way mirrors or hidden recording devices to observe subjects more freely while remaining hidden themselves. Unlike observation in a natural setting, laboratory observation offers researchers some degree of control over the environment. Researchers use psychological tests to collect information about personality traits, emotional states, aptitudes, interests, abilities, values, or behaviors. Researchers usually standardize these tests, which means they create uniform procedures for giving and scoring them. When scoring a test, researchers often compare subjects’ scores to norms, which are established standards of performance on a test. A well-constructed standardized test can evaluate subjects better than self-report data. A test has good reliability if it produces the same result when researchers administer it to the same group of people at different times. Researchers determine a test’s test-retest reliability by giving the test to a group of people and then giving the test again to the same group of people at a later time. A reliable test will produce approximately the same results on both occasions. Psychologists also use alternate-forms reliability to determine a test’s reliability. They measure alternate-forms reliability by giving one version of a test to a group of people and then giving another version of the same test to the same group of people. A reliable test will produce roughly the same results no matter which version of the test is used. Content validity is a test’s ability to measure all the important aspects of the characteristic being measured. An intelligence test wouldn’t have good content validity if it measured only verbal intelligence, since nonverbal intelligence is an important part of overall intelligence. Criterion validity is fulfilled when a test not only measures a trait but also predicts another criterion of that trait. For example, one criterion of scholastic aptitude is academic performance in college. A scholastic aptitude test would have good criterion validity if it could predict college grade point averages. Unlike correlational research methods or psychological tests, experiments can provide information about cause-and-effect relationships between variables. In an experiment, a researcher manipulates or changes a particular variable under controlled conditions while observing resulting changes in another variable or variables. The researcher manipulates the independent variable and observes the dependent variable. The dependent variable may be affected by changes in the independent variable. In other words, the dependent variable depends (or is thought to depend) on the independent variable. Typically, a researcher conducting an experiment divides subjects into an experimental group and a control group. The subjects in both groups receive the same treatment, with one important difference: the researcher manipulates one part of the treatment in the experimental group but does not manipulate it in the control group. The variable that is manipulated is the independent variable. The researcher can then compare the experimental group to the control group to find out whether the manipulation of the independent variable affected the dependent variable. Often, subjects in the control group receive a placebo drug or treatment, while subjects in the experimental group receive the real drug or treatment. This helps researchers to figure out what causes the observed effect: the real drug or treatment, or the subjects’ expectation that they will be affected. Example: Suppose a researcher wants to study the effect of drug A on subjects’ alertness. He divides 100 subjects into two groups of 50, an experimental group and a control group. He dissolves drug A in saline solution and injects it into all the subjects in the experimental group. He then gives all the control group subjects an injection of only saline solution. The independent variable in this case is drug A, which he administers only to the experimental group. The control group receives a placebo: the injection of saline solution. The dependent variable is alertness, as measured by performance on a timed test. Any effect on alertness that appears only in the experimental group is caused by the drug. Any effect on alertness that appears in both the experimental and control groups could be due to the subjects’ expectations or to extraneous variables, such as pain from the injection. Ideally, subjects in the experimental and control groups would be identical in every way except for the variables being studied. In practice, however, this would be possible only if researchers could clone people. So researchers try to make groups with subjects that are similar in all respects that could potentially influence the dependent variable. Variables other than the independent variable that could affect the dependent variable are called extraneous variables. One way to control extraneous variables is to use random assignment. When researchers use random assignment, they create experimental and control groups in a way that gives subjects an equal chance of being placed in either group. This guarantees the two groups’ similarity. The main disadvantage of experiments is that they usually don’t fully reflect the real world. In an experiment, researchers try to control variables in order to show clear causal links. However, to exert control in this way, researchers must simplify an event or a situation, which often makes the situation artificial. Another disadvantage of experiments is that they can’t be used to study everything. Sometimes researchers can’t control variables enough to use an experiment, or they find that doing an experiment would be unethical—that is, it would be painful or harmful in some way to the subjects being studied. Bias is the distortion of results by a variable. Common types of bias include sampling bias, subject bias, and experimenter bias. Sampling bias occurs when the sample studied in an experiment does not correctly represent the population the researcher wants to draw conclusions about. Example: A psychologist wants to study the eating habits of a population of New Yorkers who have freckles and are between the ages of eighteen and forty-five. She can’t possibly study all people with freckles in that age group, so she must study a sample of people with freckles. However, she can generalize her results to the whole population of people with freckles only if her sample is representative of the population. If her sample includes only white, dark-haired males who are college juniors, her results won’t generalize well to the entire population she’s studying. Her sample will reflect sampling bias. A placebo effect is the effect on a subject receiving a fake drug or treatment. Placebo effects occur when subjects believe they are getting a real drug or treatment even though they are not. A single-blind experiment is an experiment in which the subjects don’t know whether they are receiving a real or fake drug or treatment. Single-blind experiments help to reduce placebo effects. The social desirability bias is the tendency of some research subjects to describe themselves in socially approved ways. It can affect self-report data or information people give about themselves in surveys. Experimenter bias occurs when researchers’ preferences or expectations influence the outcome of their research. In these cases, researchers see what they want to see rather than what is actually there. A method called the double-blind procedure can help experimenters prevent this bias from occurring. In a double-blind procedure, neither the experimenter nor the subject knows which subjects come from the experimental group and which come from the control group.